Research into the African influences on Capeverdean Crioulo is still in full progress. African influence not being limited to just vocabulary but especially to be observed in grammar, expressions, pronunciation etc. Also Capeverdean toponyms sometimes can be traced to Upper Guinean origins. Most linguists have focused only on the variant spoken in Santiago (Badiu) because its number of speakers is the biggest and also because it’s the oldest one (besides Fogo) and most likely shows the greatest African influence. However research into Crioulo variants spoken on other islands might produce new insights as well. I’ll just post some quotes and charts on the main outcomes sofar. It seems that Mandinga & Wolof by far are the main influence. Of course linguistics isn’t always correlated with ancestral connections. Especially Mandinga has always been a widely used lingua franca throughout Upper Guinea for trading purposes but also among heavily Mandinganized peoples like the Banhuns, Beafada and Cassanga. Historically the Wolof language seems to have been more restricted although it is repeatedly said in accounts from the 1500’s/1600’s that both the Fula and Sereer were able to understand or even speak it. Given the overlap between these 3 languages i suppose it’s possible that some words being identified as having Wolof origin might actually be derived from either Sereer or Fula. Wolof influences would have entered Crioulo in its earliest formation (1400’s/1500’s), while Mandinga influence might have been present already in the 1500’s but especially dominating in the 1700’s. We have testimony from an English traveller in the 1720’s who described the Crioulo spoken on the island of Brava as containing many Mandinga words. Starting with Quint (2008). 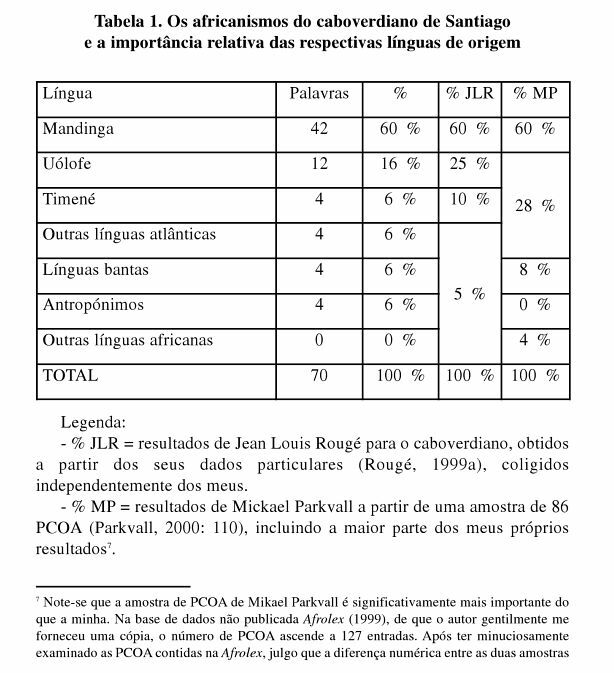 He describes 70 words found in Santiago Crioulo with certified African origins. He mentions however that this sort of research has only just started and expects eventually there might be 200-300 words of African origin to be identified in Capeverdean Crioulo. Here’s the breakdown of the 70 he classified. 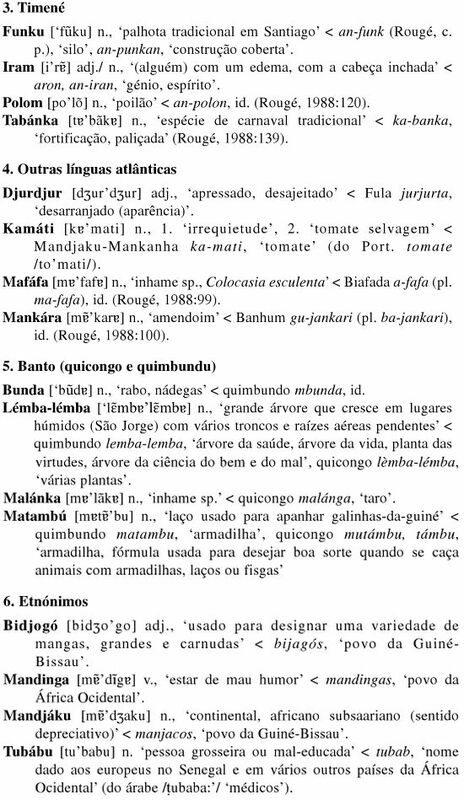 Mandinga & Wolof (=Uolofe) clearly being dominant and also the only ones to provide verbs indicating that these two languages had a far more important role than the other African languages in the genesis of Capeverdean Crioulo. Mande origins are given for 60% of all words. Obviously the Mande languages have had their own evolution ever since it started influencing Cape Verdean Crioulo most likely already 5 centuries ago. So some words might represent antique versions of currentday words in Mande languages. Quint makes a speculative comparison with the Mandinga, Malinké and Bambara languages. As to be expected most are found to be closest to the Mandinga version spoken in Guiné Bissau & Gambia. However some words are more related to interior versions, Bambara spoken in Mali and Malinké mostly in Guiné Conakry. This incl. the very significant words of Kodé (meaning youngest child) and Bombu meaning the practice of carrying infants on their mother’s backs. Of course this doesn’t have to mean per se that Capeverdean Crioulo got these words from interior Mande speakers. It could also be that these words are no longer used among coastal Mande speakers because they became “old fashioned” and got replaced by other words. Also interesting the finding of some words with Temné (=Timiné) origins from Sierra Leone. 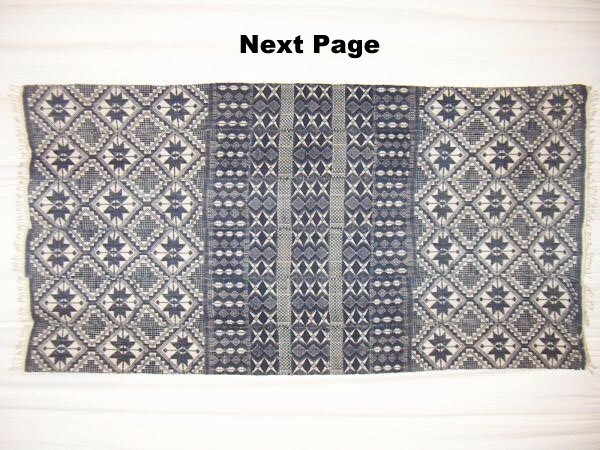 The number in itself is quite small but the words are highly significant for Capeverdean culture. Especially Tabanka (=musical style/festival but originally meaning fortified village) & Funco (=traditional type of house building). Quint assumes it’s because Temne was such an important trading language at the time and not per se because of ancestral connections (he makes the same assumption for Mandinga). However I think there’s plenty evidence that both ethnically Temne (Sape) and ethnic Mandinga speakers were present in Cape Verde to pass on this linguistical influence directly. Timene is the least known by those who have studied the Cape Verdean language. It’s a language that is now spoken in the north of Sierra Leone, in the extreme south of what was then the Captaincy of Cape Verde. Currently it is a language with a vehicular role that is much less important than in that time, in which it was the most commonly used language in the cola nut trade. Indeed, cola nuts are still the base product for the marriage dowry negotiation process in all of West Africa. Because of this important role in people’s social lives, a lot of people knew how to speak Timene. 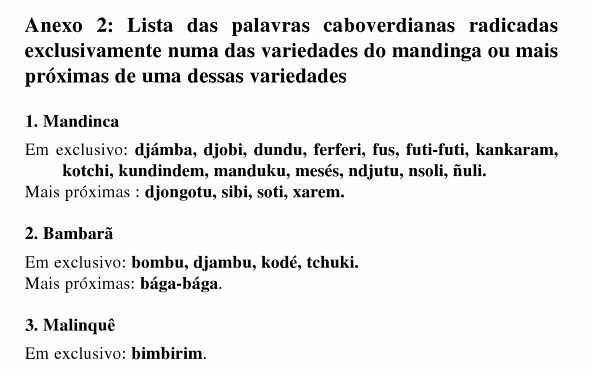 The remaining list is made up of 1 word each for Fula, Banhun, Beafada, Manjak (Papel). As future research continues it might very well be that more contributions from these languages will be found. Intriguingly there’s also 4 words with possibly Kikongo or Kimbundo origin. Still caution is in order because a word like Bunda seems to have entered Capeverdean Crioulo due to modernday contacts with Brazilians. While Lema-Lemba seems to be a tree that’s not native to Cape Verde but rather from São Tomé! Unfortunately we can’t say for any of these words how or when approximately they might have entered Capeverdean Crioulo. Languages being flexible and not static they incorporate new words all the time and through various ways. He’s basically arguing for a linguistically founding effect of the early Wolof majority among Cape Verde’s population based on semantic and gramatical similarity. Wolof speakers, as is suggested in the grammar of SC (Santiago Crioulo). This idea is also not refuted by the fact that the lexemes of Manding origin seem to be more numerous in SC than those of Wolof origin (see below): the Wolof slaves laid the structural foundations of SC [Santiago Crioulo] to which those who arrived later had to conform, but the merchants and the slaves who came from more southerly regions were able to continue to introduce African vocabulary following the end of the period of trade with the Wolofs. A few cases of simple relexification of elements from Wolof in Santiago Creole suggest that the Wolofs were the dominant linguistic group amongst the “creolisers” in Santiago. Two arguments taken from the history of the slave trade will be proposed to confirm this hypothesis. In a final section, we present a case of the survival, in a simplified form, of a verbal category of Wolof in Santiago Creole: The imperfective variety of the Wolof ‘situative’ survives in a semantically simplified form in the progressive of Santiago Creole. Both categories are marked by a series of two verbal particles, the second of which is the marker of imperfectivity. However, the Santiago Creole progressive has retained only the progressive meaning of the imperfective variety of the Wolof ‘situative’, abandoning its ‘situative’ meaning. Such cases suggest that, in the creolisation process, the language structures of the group dominant amongst the creolisers more often survive in a modified form (generally, simplified) than as simple calques. Arguably, these modifications/simplifications are intended to ease the joining of other groups. Arguing in favour for a Capeverdean origin of the related Crioulo spoken in Guiné Bissau and Casamance. Aside from the constant flow of Capeverdean lançados/traders, priests, military, officials etc. to Guiné Bissau, he also thinks the shared words of Wolof origins found in both creoles could only have been introduced by way of Capeverdean Crioulo. Wolof not having any direct connections with Guiné Bissau historically speaking. ‘savoir ou le creole est alle chercher chacun de ces lexemes est assez delicat’ [‘knowing where the creole went looking for each one of these lexemes is a rather delicate matter’] (Rouge 2006: 64).